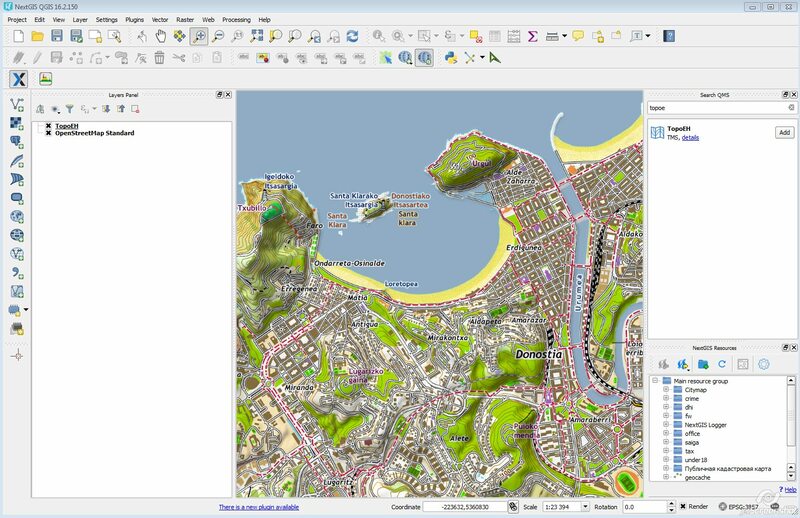 Basemap is often the first layer added at the start of a GIS project. Basemaps are often presented through different webservices: TMS, WMS, WMTS, ESRI ArcGIS Services or simply as XYZ tiles. Desktop GIS have different tools for adding basemaps. QGIS, for example, has its own providers and 3rd-party plugins to access those services. WMS and WMTS protocols are implemented in the core. It is possible to access XYZ tiles through WMS Driver by writing a special XML file understandable by GDAL. This is not convenient, as you need to remember all these addresses and takes time to create those files. Existing plugins offer some of the needed functionality, but after studying, we felt that there is a niche for a new plugin which will combine the best features. Welcome QuickMapServices – a plugin that makes work with web-based basemaps easy. Includes continuously updated list of services that you can add to the project in one click (as OpenLayers Plugin, but the latter uses webkit approach to add tiles which is not optimal). Doesn’t have problems with scaling labels on non-standard zoom levels (unlike Tile Map Scale Plugin, which uses universal GDAL driver that leads to problems with visualization and printing on non-standard zoom levels in QGIS). Uses tile access implementation with aliasing on non-standard zoom level (like TileLayer Plugin, but this plugin can’t add basemaps in one click). Is easily extendable by adding simple ini files. We didn’t limit ourselves by one type of service: you can add almost all kinds of basemaps XYZ tiles, TMS, WMS, WMTS, ESRI ArcGIS Services. Using this extention with our NextGIS QGIS build that uses GDAL 2.0 you can easily add dynamic ArcGIS Server services, such as Rosreestr maps or layers from Digital Atlas of Moscow. We’ve just started and implemented only basic functionality. We plan to extend the list of services that can be plugged via QuickMapServices and add new functionality: better work with scales, more data sources, support for native user forms for adding services on the map etc. We will be grateful for feedback, links to services that can be openly used, etc. Pull-requests are welcome at Github. Detailed manual for QuickMapServices is also available. You can read more about QMS’ contributed services, managing styles and easy services management. How can I retrieve BING and Google maps with your QuickMapServices plugin? Does QuickMapServices plugin provide searching latitude, longitude? Do you mean can it search available services geographically? Not yet,but it would be nice to implement something like this in the future. Do you know how can i generate a Map of HK? Choose a basemap that suits your needs on how HK looks. Try OpenStreetMap or MapSurfer etc. Awesome plugin ! Congrats on your work. I installed this plugin because I was having trouble with OpenLayerPlugin when exporting maps. Now How do I access google satellite maps to use as base map. Hi. Please have a look at the first question and answer above. How can I add ini files in Mac OS 10.9? I’m not able to find the folder containing Quick Map Services’ files. I’ve an .ini file I would like to load in QGIS using your plugin, and it is impossible for the moment. Why not add your service in http://qms.nextgis.com? You’ll have it available right away through QMS Search. Let me know if there are any problems. Thanks for your answer. I’ve tried to include the map in your tms repository (https://qms.nextgis.com/geoservices/1030/), but it doesn’t work. Maybe some of the data introduced by me are wrong? Is it necessary to gather official License & Copyright info? Thanks for your contribution! First of all, remove all $ characters from the URL, they are not needed and break the service. It is preferable to add licensing info as other people will be using the service you added. But we leave it of user to decide, these parameters are not mandatory. it is now working in QGIS. I hope it’s OK. Feel free to add more changes. 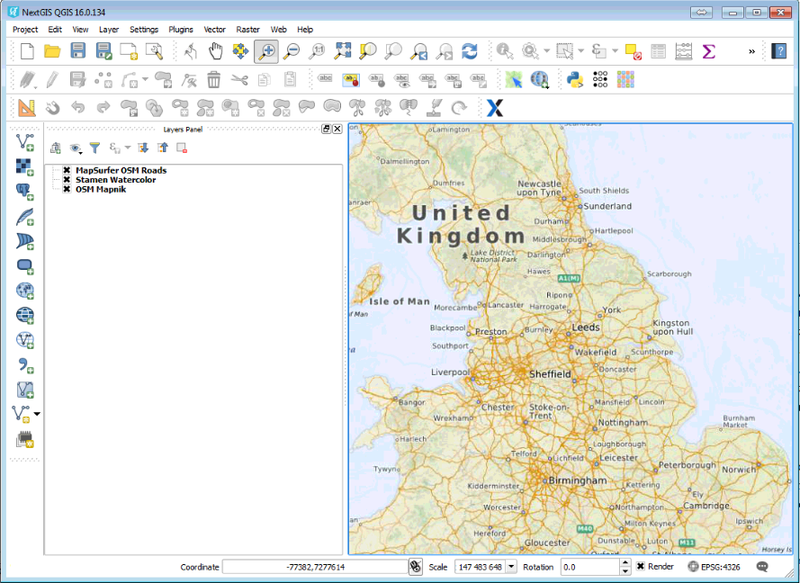 I have quickmapservice installed, but it has disappeared from the QGIS menus, it used to be there. I’ve tried uninstalling and re-installing, but doesn’t show up. any ideas how to get it back? http://m-d.me/img/ss/20170119-e3b-28kb.jpg If it is, QMS buttons are located on Manage Layers Toolbar. I was very enthusiastic about the new plugin because I thought it would solve the issue of OpenLayersPlugin in the print composer. Unfortunatelly there seem to be the same problems with the new plugin as well… In printo composer e.g. Bing maps are wrongly displayed and export is not possible. Do you think these will be fixed in the near future? The PlugIn is very nice and usefull. I miss an option to add a local tile-basemap. If I would like use an basemap on expedition without a internet connection i have a tile-basemap locally. At the moment is is only working, if i run a local webserver like tomcat or if I create manual a data_source in the “data_sources”-folder. In the dialog I can’t add this because it is not possible to set a local path. Maybe you can add a option to create a basemap from local device. It would be a nice feature. Send us pull-request or consider sponsoring its development. I opened a delimited file layer with lat and long. I tried opening all maps (trial and error which will show, one after the other). Yet, nothing showed. What must be the problem. Mine is QGIS 2.18.9 version. Thank you for your reply/help. Try adding a QMS basemap without adding delimited layer. 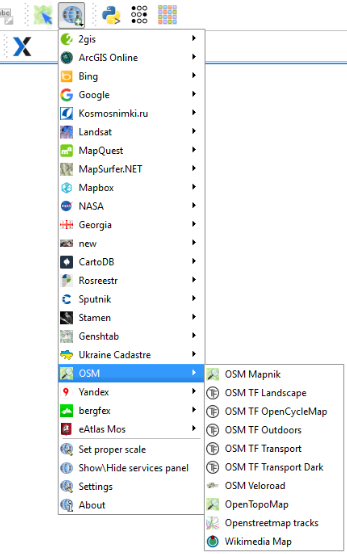 the OMS Mapnik option is not showing up in the list of available tools. i see it in the image you have above on this website but it doesn’t show up when your pluggin is installed. please explain. Hello i have downloaded the QuickMapServices, after that what do I do then? It doesn’t work yet in my QGIS. Well, start adding services in QGIS with QMS. Have a look at screenshots above, they should give you an idea. Let us know if you need more help. did you turn the plugin on under Plugins\Manage plugins? Note that your API key will become public in this case. Do you know what code needs to be added to add an API key to this? Hi Sam – did you ever resolve this? I’m having the same issue. Thanks! I’m using Google Satellite as a basemap. Is there anyway to show the map source on the map? In the layer properties there is the option to place the credit on the bottom right corner but this doesn’t appear to do anything on my screen. Is anyone able to offer assistance on the above please? I need the attribution for the map provider to appear somewhere on the map (preferably the bottom right hand corner). A simple answer would be appreciated, if possible, as I haven’t written computer programmes for over 30 years and am completely out of touch with the newer coding systems such as python. Thanks Maxim. That’s really useful. I use Qgis (v. 2.14.1 Essen) inside Portable Gis (http://www.archaeogeek.com/pages/portable-gis/). I usually don’t have any issues in installing modules from the official repo, except for the Quick Map Services module, which I cannot install. Phyton always throws an error “No module name requests”. How can I solve this problem? Unfortunately we can’t help with different packaging systems. But is there any special difference in Quick Map Services that could explain that only that module – unlike all the others – cannot be installed? Try one more time, if you were trying to install one of the previous versions there was a bug on our side with packaging requests. 0.19.3 should be good if this was related. Please try using QMS search. Generally we gradually moving away from the catalog, search should be more up to date. Please, can you mention the Path of Adding API key for request maps? Hi, I’m trying to access the google satellites image using the QuickMapServices, but when I click on the “more services-Get contributed pack, the message: “Error on getting contrib pack: 6” appears! I’m using Mac. Can you tell me how I can solve that? I am also greatly interested in a QGIS3 porting. Please let us know if it is planned, and when. Hi there, we hope this will help to speed it up: http://nextgis.com/qms-plugin-crowdfunding/ Please consider joining! Thanks for this amazing plugin ! It’s so usefull and powerfull. Hello, not sure if I understood your question correctly. QMS and Tile services in general already operate at fixed zooms/scales. Hi, I’m a new QGIS user and just discovered this plugin that I was hoping to use in creating shapefiles. So I installed QMS in QGIS 2.18.16 but when try to use by clicking “Get contributed pack” under QMS Settings/More services, I get an error message that says “Error on getting contrib pack: 3”. So I can’t use QMS on either versions of QGIS. 🙁 Hope someone could help me solve this issue. Thanks! *Note: I translated the above line to English as the original was in Japanese. I’m using Win 10, Japanese OS. Can you please also write us at info@nextgis.com, we’ll need some more information from you. Hi, I’d like to add that I only clicked on “Get contributed pack” as nothing in the map options (NASA, OSM, etc.) display when I click on them. This is true for both QGIS 2.18.16 and 3.0.1. I searched online and could not find any English site that addresses this issue, but found a Japanese site that says to click on “Get contributed pack”. Hi, I updated to 0.19.7 but still not working. Below is the error message that I got. Thank you though for trying to fix it. can we please move the discussion to our email info@nextgis.com? These comments aren’t really a discussion forum. We’ll follow with resolution here. 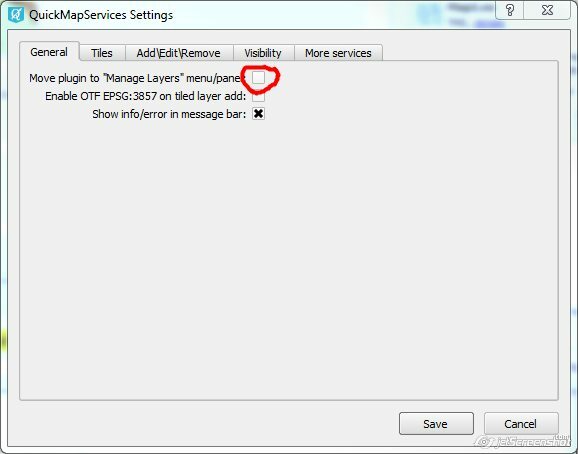 Hi, I’ve install quickmapservice on QGIS 3.01 but there are no entries in menu, no QuickMapService under internet . How can I avoid Shrinkage of the labels when printing the OSM Standard Map? Try using different tile renderer. It can be set under QMS settings, TIles. QMS settings, Tiles, check/uncheck under use internal renderer – reload a service. If you’re using QGIS3 this will not be possible, I think. works well in version 3.2 QGIS? Почему-то слетело меню плагина. Нету меню в панели, Хотя утверждается, что модуль установлен. Переустановка модуля и программы не помогает. Заранее спасибо! Color indicates status of the service from our monitoring. Just to clarify that the QuickMap plugin leverages Quickmap services from this product: http://www.quickmap.co.nz or it’s something different? Very simple question Qgis/Quickmapservice question. I am looking at an area and have the scale set at 1:50000 and using the “OpenTopoMap” and the labels look fuzzy. What is the best way to resolve this?